― David Mitchell, Black Swan Green Surviving winter in Montana means keeping warm, and warming our home. Wearing layers will do it. Turning up the heat will do it. Feeding the wood stove will do it. We choose to limit the thermostat but keep the wood stove burning while donning layers when we move into other rooms. Our choice of wood heat requires pre-planning. Before the snow flies we must have wood laid in. 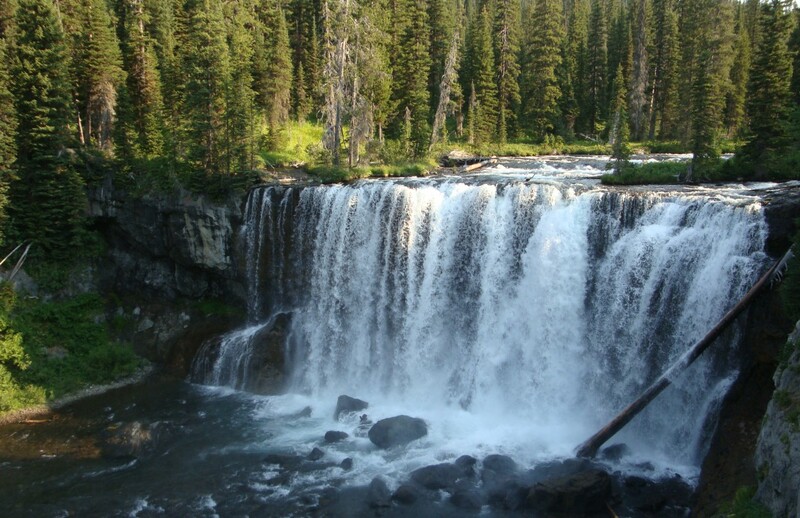 June is usually the month we head up into the national forest to find dead Lodgepole, Englemann Spruce or Douglas Fir. My June travel to Washington postponed our woodcutting by a few weeks, and we are in the thick of it now. Our first foray led us to a large standing dead Lodgepole that Fred had noticed earlier. He thought it might be large enough to fill two truckloads. We felled the tree, looked at each other, and wondered what we had gotten ourselves into. Two truckloads turned into five, and even lifting together, we had to cut the logs to half normal size in order to heave them into the trucks. The tree was long and thick all the way up to the top. During a break, I counted the rings. Without a magnifying glass, I can only give an estimate but this was an old tree, at least 200 years old. It had stood so long, so tall and proud. More than any other tree we’ve cut, I felt sadness at its passing. And at our felling of it. Our lodgpole grew very quickly its first 60 years, slowed slightly, then slowed dramatically. It’s last half century were tiny increments of growth. During its early years, this tree must have been a member of a tight forest. Perhaps it grew from an opened serotinous cone after a fire swept through the area, heating the cone to 113 degrees Fahrenheit and opening the canopy to sun. Lodgepoles are shade intolerant trees. Any limbs shaded in a forest will wither and fall. Our tree had long ago lost any lower limbs and was clear of branches to almost its crown. 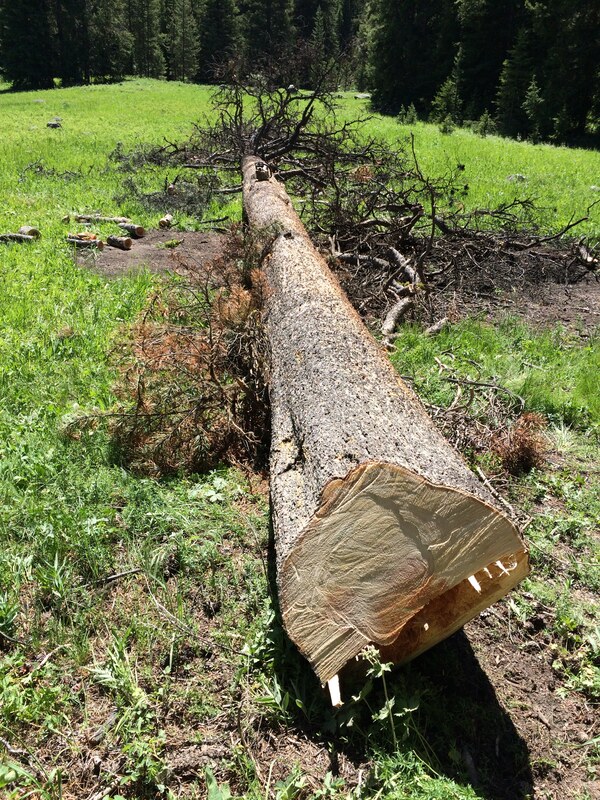 Over the years, our tree must have lost its forest compatriots for when we cut it, it was on the edge of an open meadow. Our tree may have been a sapling soon after Lewis and Clark returned from their travels across the continent. While they did not travel as far south as our tree grew, they set in motion events that led to settlers moving West, John Colter exploring the Yellowstone area as he trapped beaver, miners passing this tree as they searched for silver and gold, the establishment of the tiny mining community of Jardine and the first burials in the Jardine cemetery. Perhaps our tree saw the Crow (Absaroka) Indians move through the forest. Though its scientific name is Pinus contorta, the lodgepoles growing in the Rocky Mountains were valued as poles for lodges and tepees. Or, perhaps our tree spent its early days less with humans and more with grizzly and black bears, wolves, marten, elk, moose and deer. Our tree saw the establishment of Yellowstone National Park while it was still growing quickly. It was there when the Nez Perce fled the army through the Park in 1877. Our tree was growing strongly when Theodore Roosevelt dedicated the Arch in Gardiner on Yellowstone’s Border. By the time autos entered the Park, the tree had matured and slowed to its miniscule growth. 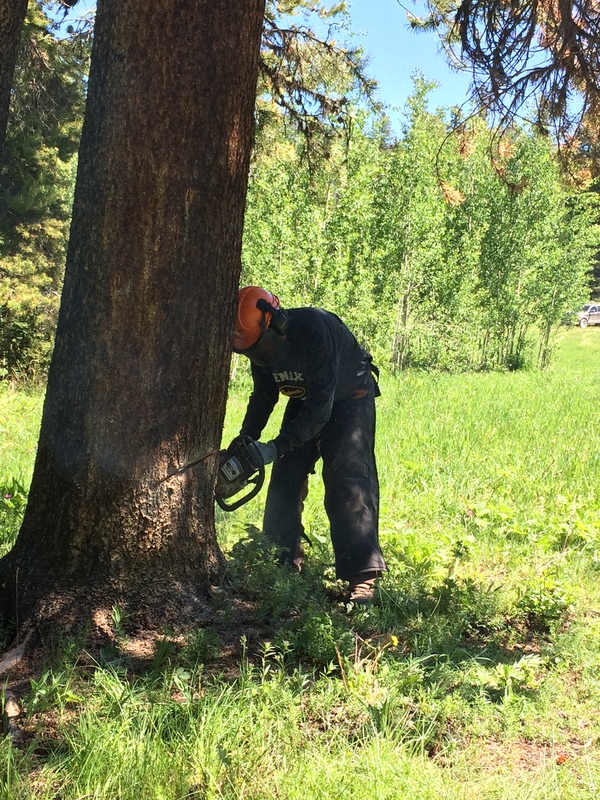 Our tree became part of the Gallatin National Forest in 1899. It lived through two world wars, the Korean conflict, VietNam. It has lived through presidents, changing politics and policies. What took its life? Was it age? Pine bark Beetle? Drought? Climate Change? Perhaps all of these combined. Our lodgepole watched thirty years of skiers competing in the Jardine Ski Run, even more days and years of skiers and hikers enjoying our public lands, watched years of snowmobilers heading up into the mountains, many carrying skis to climb high and get turns. The tree watched campers drive slowly on the two track road, looking for a safe place for a night’s sleep. As we work, sweating in the sun, I think of how this tree warms us twice. First when we work to bring it in, and next when we burn it with gratitude while winter winds howl. I think, too, of the lessons it teaches. Perseverance and survival. And this tree is a survivor, persevering through bitter winter winds and through hot summer drought. Another lesson I read in the rings is the importance of public lands. These lands provide habitat for wildlife, space for trees to grow into old age, places for humans to recreate, renew the spirit, and cut wood to heat our homes. Would this tree have survived as long as it did were it were not on public land? Could we have gathered it for use in heating our home if not for public land? My life is tied to public land. “All ethics so far evolved rest upon a single premise: that the individual is a member of a community of interdependent parts.The land ethic simply enlarges the boundaries of the community to include soils, waters, plants and animals, or collectively the land.” Aldo Leopold, A Sand County Almanac. 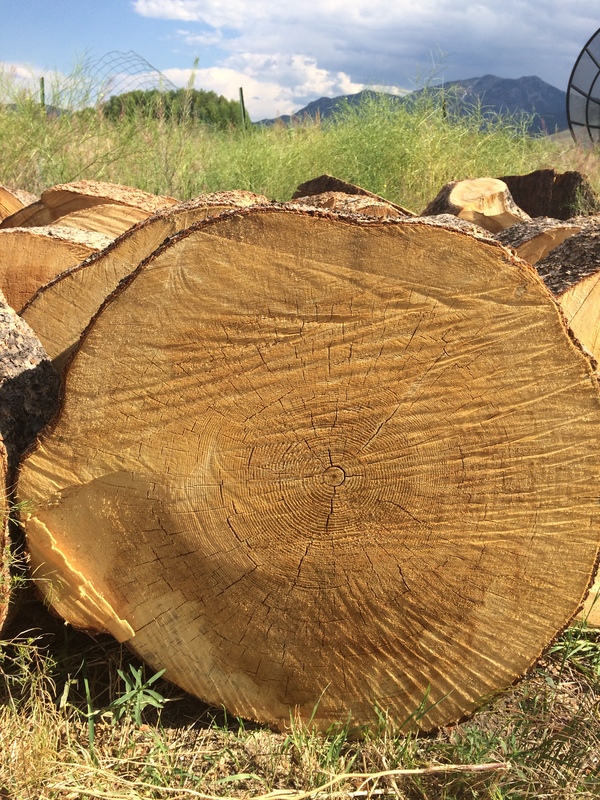 Excellent piece, Julianne, and love the tree ring picture. My dad was an Ohio farm boy, his dad a tenant farmer, and he grew to be a wood/pulp/paper organic chemist and teacher. He loved trees, doing his masters thesis on the osage orange. His ashes (and mother’s were added later) lie beneath a gingko. Or, perhaps by now, have long ago become part of the soil and the tree and the ants and the squirrels and the fungi and the lichens and the birds and the air and the water…. May your tree warm you well. Ahh, thank you, Neysa. I love that your dad was into trees. I would have liked him, I am sure. And he did well with you and your love of all things natural.